For today’s edition of Take One, the 'rock room' is spinning Bruce Springsteen’s 1978 single, ‘Prove it all night’.‘Prove it all night’ b/w 'Factory' was the first single released from Springsteen’s classic and famed 1978 LP Darkness on the Edge of Town. 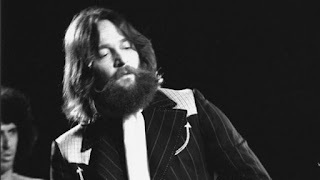 While the song did not explode up the charts, reaching only #33 on Billboard, the track is a critical chapter in the hearty volume that is Darkness on the Edge of Town. ‘Prove it all night’ not only acts as a vital album cut and critical single, the song also blossomed into a live concert centerpiece where an expanded and cinematic instrumental prelude and finale contributed a stirring and emotive addition to the lyrical narrative. The studio version single was released on March 23, 1978 and in staying consistent to the themes expressed on the Darkness record, ‘Prove it all night’ explores the ideas of the consummation of a relationship being the ‘proof’ of love, in addition to emotional expression; material objects, hard work and varied actions that separate someone from crowd and illustrate their respective worth are all explored as 'proof'. ‘Prove it all night’ lyrically and musically is saturated with sexual connotations, but these expressed moments of intimacy tie into the everyday need to ‘prove it’ regardless of the situation or relationship. The ‘proof’ is reciprocal as both the narrator and the subject must show their worth in love and life in order to confirm their worth and promise. The song begins with a ringing dual piano and keyboard introduction that soon eases into a quintessential and breezy E Street swing. The melody hails from a 1950’s hot rod window passing by on city side streets, its cool melody injected with Springsteen’s own gritty and practiced barroom aesthetic as he inhales it from the air. The gentle lilt of the song (hammered flat on a live stage) contrasts with Springsteen’s excellent potholed vocal attack. The first solo break is stunning with Clarence Clemons ocean liner sax spot followed by the strangled squeal of Springsteen’s succinct response. The second verse finds the music dropping out completely leaving only Weinberg’s heart heartbeat and Springsteen’s husky whisper. Organ drizzles and a soulful wordless moaning outro help ease the studio single version to the tempered roar of its conclusion. At a Landover, Maryland concert in 1978 Springsteen introduced ‘Prove it all night’ with a conversation that originated during a New York City cab ride while recording the Darkness album. The crux of this documented discussion, which obviously made a creative impact on Springsteen started with the driver who expressed in his dialog with Springsteen, paraphrased here, ‘All your life you’ve got to prove something to someone, weather it be your wife, your boss, your kids’. 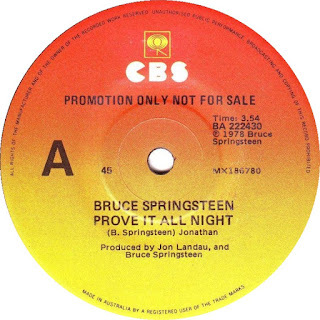 The seed for ‘Prove it all night’ had been planted in Bruce and was allowed to germinate, until taking its place as the next to last number on his upcoming album. Like a heroic seed pushing through the cracked concrete of a damp Jersey side street, ‘Prove it all night’ would grow reaching glorious and epic proportions on the 1978 tour leaving its cracked shell behind to languish beneath its increasingly imposing shadow. There are multiple live examples included in this text illustrating how the song expanded into a filmic combination of melody and narrative. The most famous readings of the track hail from famous bootlegs in Cleveland and the aforementioned Landover, Maryland performance which have both now witnessed official releases. The 1978 live renditions keep to the general blueprint of the studio version with the exception of adding an extended instrumental introduction and juiced up solo spotlights throughout. The introduction has taken on legendary status among Springsteen fans with requests popping up throughout the years for the band to return to the famed 1978 arrangement. Springsteen and the band did oblige at a 2012 Barcelona concert with a rendition of the classic Darkness arrangement for an obviously ecstatic crowd. The band performed the beautifully crisp studio single version while injecting it with rocket fuel and shooting it to the top of the mountain to enjoy some 360 degree views. These live versions sometimes ran to over ten minutes and featured some of Springsteen’s most intense riffing of the era. Welded onto the introduction of the song is a vivid prelude started with the gentle piano rain of Roy Bittan trickling across the hood of the introduction. Danny Federici lends slick keyboard flourishes as Max Weinberg’s hollow snare rim clicks keep anticipatory time. Springsteen enters the groove and floors it to the boards abusing his Fender ‘Frankenstein’, the now famous ax comprised of a worn barn door Telecaster body (aesthetically similar to Keith Richards ‘Micwaber’) and sleek Esquire neck. His tone acts as a laser shot through a closed closet blackness. The band shows restraint while Bruce paints with wound taught strings. Springsteen soon hits on a beautifully relevant counter melody that increases the tension as the group rises to the challenge behind him. A sensual climax is reached as Bruce seizes the rising vibe while strangling his notes, playing serrated sonic strikes before landing perfectly in the ‘Prove it all night’ introduction. After displaying some of Springsteen’s finest guitar experimentation to be found in his career the band tears through all the proof that is needed to show the crowd what the ‘E Street Band’ is all about. Please seek reference here of how this Springsteen single metamorphosed into towering rock euphoria on the numerous stages of late 1970’s America. The roads paved and words crafted on Darkness are taken with two wheels in the air as the ‘Big Man’ and Bruce duel in perfect duality throughout the 78 tour. The band’s unity is chilling, the thump of eager hearts beating louder as Springsteen slips the shoulder off of the dress of the second verse while preparing for an inspired conclusion. Bruce’s primal screams of justification as the song pressurizes raise hairs and stun the collective crowd. The band thrashes around the stage, closely following the neck of Springsteen’s stringed lance as it knifes the air. Hallelujah! The rock and roll gods have been appeased! 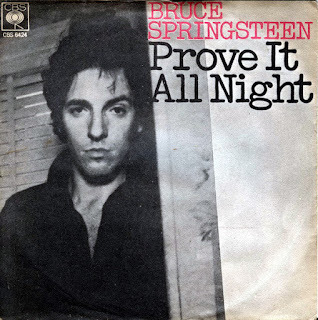 Bruce Springsteen’s 1978 single and album track ‘Prove it all night’ is only one chapter in the vital musical narrative of the LP Darkness on the Edge of Town. 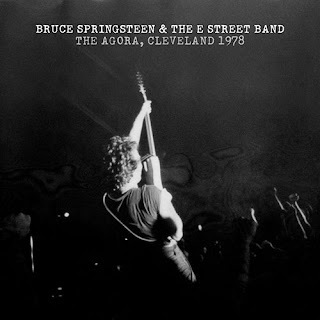 It’s multiple musical guises to be enjoyed while represented as a single, an album track, and a multifaceted live tune that symbolizes the devestating and now legendary concerts performed by Bruce Springsteen and the E Street Band in the 1970’s.